“Nothingness more than infinite” is a new mural by MIEDO 12 presented by Contorno Urbano for the 12+1 project, Urban art in l’Hospitalet de Llobregat (Barcelona, España) MIEDO 12 is a famous graffiti writer from Valencia, Spain. He’s a member of BN, a 21 years old Italian crew. Miedo 12 began graffiti in 1998. More info and images after the jump. Street artist Deih XLF recently completed some new work in his hometown of Valencia. One of the pieces with features a zombie version of one of his famous characters with the words “Viva Mola!” on top which roughly translates to “Living Rocks!” The piece also has “Zombie Series” scrawled next to it, which means we can only assume it’s one of many more to come. 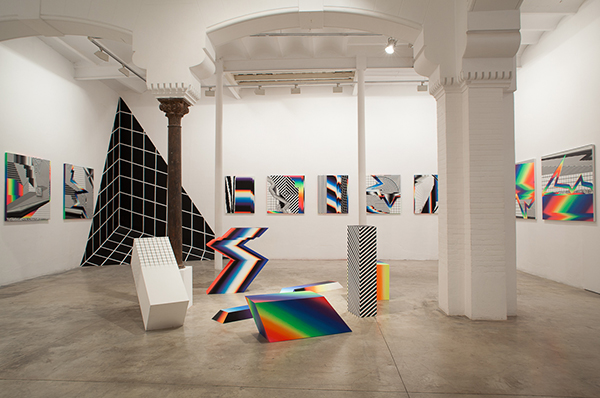 Bizarre Beyond Belief Issue #17 interviewee, Felipe Pantone, who resides in Spain has brought his exceptional painting skills into Delimbo Gallery in his hometown of Valencia. In his latest exhibition “Opticromías,” Pantone created a number of painting and sculptures in his signature glitchy, geometric and 80s esthetic. The incredible Spanish street art duo PichiAvo are back in their hometown of Valencia in Spain where they just finished working on this new Christmas piece. Painted in their signature Greek style with a little added homage to “Wild Style” the duo created a holiday piece that really pops.